Dear valued customers and tourists. Our offer included private transports Tuk Tuk, SUV car Lexus, Highlander and the minivan with driver & tour guide service. For your visiting to Siem Reap city, Angkor Wat temples park, and adventure in Cambodia to explore the impressive monuments the home of sandstone temples of Khmer Empire. 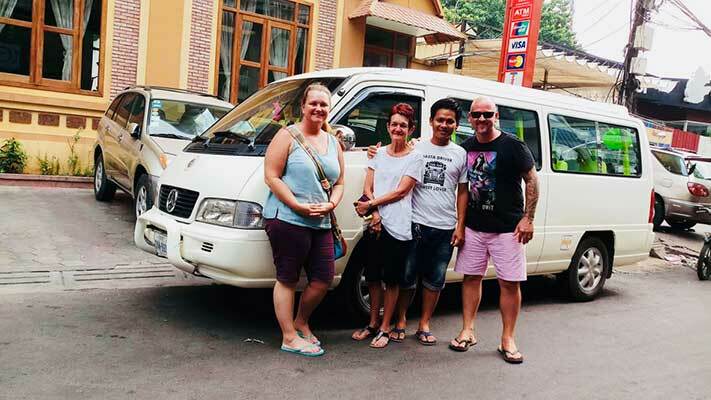 Would you the need the fluent English-speaking driver and tour guide then contact Sok Phat, team drivers arrange personal tours. Save your time, booking your personal tour and perfect transport with a private driver to discover Cambodia. Mr. Sok Phat, Mr. Sam Oeung, Mr. Oggy, Mr. Tearak Mr. Leng Pisal, Mr. Sok Ra. The tour guide Mr. Mab, Mr. Nut Borei, Mr. Nin Chan, Mot Sam Nang, Please hire us as your private drivers and tour guides. We are proudly service provider the city of Siem Reap attractions, monument Angkor Wat, all cities Cambodia for ten years. We prefer to price our services fairly and build our clients base one satisfied customer at a time and Our courteous customer service specialists, we are available for your chauffeurs, more than Angkor Park, but also do more countryside tours, adventure villages trekking jungle tour, temples, floating village tour, fishing stilt house flooded forest tour and private overland transfer all cities in religion. You able emails, giving the text, contact 24 hours a day, 7 days a week. Whether, special event, business trip, the city tours, our services fleet is ready for you and we guarantee that comfortably and in a timely manner. We are luxurious chauffeured driven latest models minivan, SUV car, Tuk Tuk transportation services. We are proud to say that have recommended come to us. Clients have always relied on my customized services for all their requirements and transportation needs. Hello everybody, my name is Sok Phat’ you can call me “ Phat “ just for a short, it’s easier. I am a young entrepreneur, age 29, I am an honest working heart for my family. I am a fully licensed English speaking driver and guide and teamwork leader. I have taken tourists to temples daily and experienced. So we give the suggestions to adventure, the unseen attractions and built tanneries to temples of Angkor, Phnom Phnom, dolphin watch at Kratie province, trekking tours Mondulkiri, Rattanakiri tribe, minority villages northeast Cambodia and beach sites. I can accompany travelers all Cambodia sites, I have well knowledge about my cities, ways an expert in historical attractions and create your tour itinerary. We will be very pleased to be your assistant and local driver. We having working hard to make sure that my clients are well taken care of, comfortable, safe and that they are treated fair in our communities. We do understand that, while at Angkor, family holiday and traveling in a group, you are most interested in seeing the sights of our historical civilization. Our expertise will be in providing a safe attentive full day of travel and touring. Afternoon and evening excursions as well. I am dedicated to ensuring that my clients have well taken of that treated by our community and other vendors. Address, Road No: #6, H: 026, Salakanseng Village, Svay Dungkum Comune, Siem Reap District, Siem Reap Province, Cambodia.